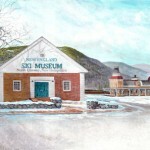 Without members, the New England Ski Museum would not exist. With the help of its membership, the Museum has been able to accomplish much in its four decades of operation. Each year membership dues and donations comprise over one half the Museum’s operating budget. If you have an interest in ski history and our activities, we urge you to join us. The support of our members is vital to our continuing growth. Discount of 50% on image use fees over $60. To become a member of the Museum please write or call for membership information or click here to sign up online.